Camping au Bord de l'Aisne si trova a Guignicourt, Aisne, è situato fiume/torrente. Questo campeggio dispone di piazzole delimitate, senza ombra e piazzole poco ombreggiate. È possibile affittare casemobili. Il campeggio dispone di un parco giochi. Per gli sportivi, il campeggio prevede diversi percorsi in bicicletta. Ci sono uno spazio fitness. Per chi desidera rilassarsi dopo una giornata intensa ci sono sauna e idromassaggio. Il campeggio dispone di una piscina scoperta, una piscina coperta con copertura scorrevole e una vasca per i più piccoli. Non è sempre necessario cucinare, perché all’interno del campeggio ci sono snackbar e pizzeria presente. In campeggio è possibile acquistare pane fresco. Potete navigare su Internet, poiché nell'80% del campeggio potete navigare con il vostro portatile. Ogni anno un ispettore visita il Camping au Bord de l'Aisne, controllando oltre 200 tra attrezzature e altri punti di interesse del campeggio. L'ispettore è un dipendente ACSI e non lavora per il campeggio. Had potential to be so much nicer. In need of some care. very nice campsite but be warned; its expensive. basic price is for van and 1 person. everything else is extra so you pay fir 2nd person, you pay for electric etc. large flat pitches, good facilities but only 2 male toilets so get your timing right! nice pool, good bar, rural feel but close to autoroute. easy walk to town bakery. Why is this in the ACSI handbook for two nights with tepid showers, no toilet paper it's hard to see what you get for your money other than patch of grass with electricity. Very nice well maintained site it was so nice to see grass again after coming from the south. It is in an excellent position just off the motorway and good for motorhomers as there is a large Carrefour within walking distance. The facilities were very nice but there were only 2 toilets in the ladies plus one disabled for a busy site this was not enough. As previous reviews have stated it is expensive the most we have paid both in the UK and France and for that price toilet paper ought to be provided!,, would certainly use this site again. we use the site regularly as a stop over after/ before the ferry from/to Dover. It is very clean and the sanitary block was all new in 2013 so do ignore a comment made before that date by someone. It is not cheap but there are so few sites in this area; it does not accept the ACSI card for discount rates. the staff are really helpful and welcoming. Terrific site, very friendly staff giving a great welcome. The facilities are terrific although we didn't get the chance to use the sauna but it looked very appealing. A great site for a stop over due to it's proximity to the motorway, but it would be great site for a longer stay. For a Brit on the way south this is an ideal stop-over (150 miles from Calais) that deserves much more than it's 2 stars. We stayed here for two nights. We could choose our own pitch either by the river or elsewhere. Please be aware of the toilets/showers, the toilets are filthy, no seats to sit on!! and please take your own toilet roll as none supplied. The showers are very small and you had to press the water button for ages to get some luke warm water to have a shower!! The small town is not far to walk to, with a very good supermarket. We could have our own BBQ outside our motorhome. You have to pay for the wifi which we thought very expensive. It's ok for a stopover, but that's about all, as the toilets/showers really put us off. We had a switch card to come and go off site, which opened the barriers, but the staff wouldn't give us our passport back until we handed in the card the day we left. Wouldn't recommend this site, after a long day of driving you need a hot shower which wasn't the case. Volete prenotare il Camping au Bord de l'Aisne o oppure saperne di più? Potete farlo usando i seguenti dati. Da Guignicourt D925 e seguire i cartelli. 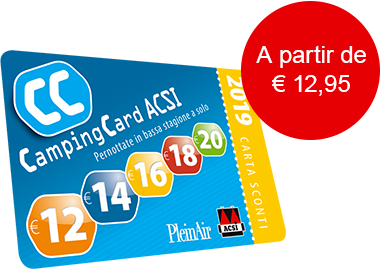 ACSI Eurocampings invia la tua richiesta di informazioni al "Camping au Bord de l'Aisne".